Enjoy the current installment of “weekend reading for financial planners” – this week’s edition kicks off with a small act of contrition from the CFP Board, which acknowledged this week that it “could have done a better job” in looking at compensation disclosures on its website, and announced that the organization will now begin to do its own “spot checks” on its website compensation disclosures along with making it easier for brokerage firms to ensure that none of their employees indicate that they are “fee-only” in violation of the current rules. From there, we have several practice management and technology articles this week, including some ideas for new client (or prospective client) events to try out, tips on how to pick a CRM system (either as a change or for the first time), a review at a new all-in-one advisor platform called Advyzon (being built by one of the former architects of Morningstar Office and Workstation), a look at how RIAs now surpass wirehouses in their share of ETFs and long-term mutual funds (if you’re an RIA, expect a lot more contacts from product providers trying to reach you in the near future as the industry wholesalers shift! ), and a discussion of how to fix (or create for the first time) an incentive compensation system for your employees. We also have a few more technical articles this week, with a discussion of why SPIA payouts still seem to be given their money’s worth despite today’s low rates (in large part perhaps because the long end of the yield curve has already priced in future rate increases? ), a great analysis from AQR’s Cliff Asness of why markets are not rigged (despite the allegations in Michael Lewis’ “Flash Boys”) and how HFT firms are really just a more cost efficient version of what market makers have always done, and a nice overview of the key points from the new “hot” book on income equality, Thomas Piketty’s “Capital in the 21st Century”. We wrap up with three interesting articles: the first is from Jason Zweig of the Wall Street Journal and looks at the rise of the “Robo-Regulator” – FINRA’s new CARDS approach to applying big data insights to try to find questionable activity in brokerage accounts; the second is a discussion from industry commentator Bob Veres about how independent firms and fiduciary advocates may be losing the fight against the lobbying dollars of Wall Street and what the next step should be (hint – band together with other organizations fighting the “Bigger Fight” as well); and the last is from Gail Graham of United Capital about how small advisory firms may soon need to get a whole lot more serious about marketing, because some large ones are already beginning to step up. Enjoy the reading! CFP Board Aims to Fix Its Fee-Only ‘Mistake’ – This week, the CFP Board acknowledged that “we could have done a better job” in looking at compensation disclosures on its website, and that the organization will be rolling out two new initiatives aimed at preventing a repeat of the problem. The first is that the CFP Board will begin making “spot checks” of information that advisors disclose on the website, cross-checking compensation disclosure information on the site against public sources such as regulatory filings and firm websites to verify its accuracy (if discrepancies arise, it can lead to a further investigation). The second initiative will allow firms to create companywide “blacklists” that would preclude employees who are CFP certificants from identifying themselves as fee-only (thus, for instance, a broker-dealer group could preclude any advisors affiliated with the firm from declaring themselves as fee-only). Notably, though, the new initiatives do nothing to otherwise change or clarify the compensation disclosure rules, or bridge the rift in compensation definitions that has emerged between the CFP Board and NAPFA, which could potentially disqualify 100-125 of NAPFA’s 2,500 members (though NAPFA CEO Geof Brown indicated that the group is aiming to resolve the issue ‘very soon’). 8 Ideas for Better Client Events – Notwithstanding the growth of social media and digital marketing, there’s still a lot of value to doing in-person events, whether to enhance relationships with current clients, get yourself in front of prospects, or build connections with centers of influence and other professionals in the community. However, while seminars in particular have been a classic event-based approach – especially in the context of prospecting for new clients – “the days of luring prospects with a free informational session and a good meal are over.” In this article, marketing consultant Marie Swift provides some examples of successful alternative events that one advisor has been using, including: a “client speak” event where clients share stories with each other (e.g., a group of recent retirees talking about how they’re transitioning their lifestyle and what’s working well for them); a psychologist to provide some ‘retirement coaching’ to pre-retirees; personal client celebrations (e.g., throwing a retirement party for a client for up to 50 of their friends at a local winery); a pig roast family appreciation event (held on the rural firm’s back lawn to give it a ‘homey’ feel); a giant clam bake annual client appreciation event; an “opportunity fair” for local non-profits to share information to the community about how people (e.g., recently retired clients) with available time can get involved; and a shredded party (the firm provides a shredding truck and free food to anyone in the community that brings items to be shredded). How To Pick The Best CRM System For Your Practice – Having a good CRM system is crucial for growing an efficient advisory practice, yet a surprising number of advisory firms still have no CRM at all, and many that do have an outdated system that is overdue for a change. This article provides some helpful best practices tips for an advisory firm considering a new (or first-time) CRM system and trying to pick the right one, including: understand what a CRM really is (it’s about capturing activity and who does what and when; Outlook is not a CRM! ); seek advice from peers (ideally, peers running a similar size firm and type of business model, who can speak to the CRM’s relevance in the proper context); get a demonstration (get multiple demos, and be certain to take the CRM for a test ride as well); know what integrates with the CRM (the point of CRM is efficiency and the potential for automation, and integrations help that process and reduce redundant data entry efforts); and consider the future (having a robust CRM is key for facilitating a succession plan or sale). First Look [At Advyzon] – This article by technology consultant Joel Bruckenstein provides a software review of Advyzon, a new offering by a company called YHLSoft that is aiming to be an “all-in-one” advisor workstation. Despite the fact that most all-in-one solutions have had limited success (Tamarac Advisor Xi and Morningstar Office are the only two exceptions that come to mind), Bruckenstein notes that the initial look at Advyzon suggests it may be a new contender in this space, due to four key characteristics: a really good user experience (the software is easy to use for the advisor); a well-integrated user experience; a strong value proposition (while the software is not ‘cheap’ starting at $6,000/year it is competitively priced for what you get, including client and prospect management, portfolio management and reporting, tax-aware rebalancing, a work-flow engine, an email client, alerts, and business analytics); and strong industry experience and knowledge (the chief architect of Advyzon previously held a similar role working on Morningstar Office and Workstation, so he understands the needs of advisors very well). Bruckenstein provides a detailed walkthrough of some of the current functional areas, and concludes that ultimately the software still needs to finish some key features (the planning tool is sufficient for light planning but not fully comprehensive, the workflow engine and email client are due out later this quarter, etc. ), but that with the core engine so far, data feeds from the four major custodians, and a functional visually pleasing client portal, Advyzon is off to a very strong start. RIAs Surpass Wirehouses In ETF Asset Distribution And It’ll Mean Change – The explosion in ETFs in recent years has been rather broadly based, but the ongoing rise of RIAs means that now, the total volume of ETF assets under management in the RIA channel has surpassed that of wirehouses, at $364B versus $311B respectively. Similarly, the total amount invested in ETFs and long-term mutual funds across the RIA channel is now up to $1.67T, which exceeds the comparable category total gathered by the top wirehouses (Merrill Lynch, Morgan Stanley, Wells Fargo, and UBS). This crossover is creating some challenging shifts in the ETF industry, which struggles to figure out how to effectively reach the RIA channel, that is not as neatly concentrated in centralized large branch office locations as wirehouses are. In fact, almost 50% of RIAs firms have under $100M in AUM, while large RIAs with $1B+ in AUM are barely 5% of firms, and since there are too many firms to visit one at a time, ETF providers are looking to alternative approaches, from telemarketing to working through custodians. The bottom line from the advisory firm perspective: ETF (and other) asset management providers are going to take increasing notice of RIAs as their growth continues, so expect a lot more investment product providers reaching out by some means or another! How to Fix Your Incentive Pay – This article by practice management consultant Kelli Cruz looks at the compensation trends for advisory firm employees, and in particular how to effectively structure incentive compensation (as now a majority of both professional and nonprofessional employees at advisory firms receive a combination of base salary and incentive pay). At its core, the idea is that base salary should be fair compensation for an employee’s role and responsibilities, while incentive compensation is for those who meet or exceed stretch goals for the firm (or the individual, or both); both should be part of a well-documented compensation plan, so the employees know and understand the rules of the ‘game’ they’re playing. The documentation for base salary should include both a range of salary for each position in the firm, and the details of job expectations and by what metrics the employee will be evaluated to advance; in the case of incentive compensation, it’s even more critical to tie incentive plans to specific objectives and outcomes, so employees know what they must do to succeed (Cruz advises against discretionary bonuses). Overall, Cruz’s steps to designing a good incentive plan are: establish the firm’s strategic goals first; create a compensation philosophy (how competitive are you trying to be? ); determine eligible positions to participate in the incentive(s); identify how incentives will be funded (percent of revenue? percent of profits? ); set the incentive drivers (what must employees do to achieve the incentives); run the numbers and make sure the incentive model works and won’t break the bank; get team input (and buy-in) by giving them a chance to give feedback before implementation; and communicate the plan thoroughly when it is implemented. Why SPIAs are a Good Deal Despite Low Rates – On Advisor Perspectives, financial advisor and actuary Joe Tomlinson looks at the current landscape for Single Premium Immediate Annuities (SPIAs), suggesting that they may be appealing to consider despite today’s low rates. His analysis stems from an examination of the comparability of SPIA rates between the US and the UK, where even though government bond rates are similar the US payout rates are significantly higher (by approximately 12% to 17%). To evaluate whether the buyer is getting “their money’s worth”, Tomlinson draws on longevity/mortality data from the Society of Actuaries and adjusts it for the relatively more favorable mortality rates for those at a higher socioeconomic level (e.g., clients of typical advisors), to compare the actual cost of the annuity to the present value of anticipated annuity payments discounted at a current long-term government bond rate. The conclusion of the analysis is that US SPIAs are quite appealing relative to comparable long-term government bond rates, and are still fairly competitive relative to corporate bond rates. Of course, it rates rise significantly, waiting may still be a better deal, but Tomlinson notes that the long end of the yield curve has already priced in rising rates in the future (thus the upward slope of the yield curve), which indirectly may help to explain why the “money’s worth” analysis and results remains so appealing. High Frequency Hyperbole, Part Deux – This article from RealClearMarkets by Cliff Asness and his team at AQR Management provides some ongoing analysis and explanation of why the recent hubbub about High-Frequency Trading (HFT) may be overdone since the release of Michael Lewis’ “Flash Boys” book, and tries to take an impartial look at the issue (as AQR itself does not do HFT and therefore “doesn’t have a dog in this fight”). Accordingly, the article takes on and responds to several of the key criticisms, including: HFT’s supposedly excessive profits (yes many HFTs serve as market makers and make profits, but it’s actually more competitive and less profitable for most of them than the prior lower-tech specialist-monopoly market structure of the past, and it’s a natural function as a market maker to be profitable, as market makers have always been for serving as a middle man! ); HFTs engage in front running across exchanges (actually, HFTs cannot see orders placed in multiple exchanges, all they can do is see trades actually executing on one exchange and make educated guesses about supply/demand shifts that may flow to other exchanges as well); HFTs create only fake liquidity (yes HFTs do put out potential orders and then cancel them, but that’s what market makers have always done, and no market maker ever just sits around with an open-ended order at a fixed price forever, and in fact historically market makers had an even greater speed advantage to change/cancel orders when transactions took tens of seconds to fill! ); and that the market is rigged due to HFT (consumers have benefitted from the tighter bid/ask spreads, and because of how retail brokers operate via trading ‘wholesalers’ consumers actually get even tighter spreads than HFTs do!). Notably, Asness and his team do acknowledge that there are some questionable players in the HFT space that do deserve to be disciplined, but overall the conclusion is that HFT is not nearly the demon that it is made out to be. 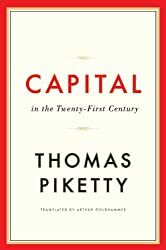 The Short Guide to Capital in the 21st Century – The big buzz in economics for the past few weeks has been the release of French economist Thomas Piketty’s “Capital in the 21st Century” and its study of income inequality. Some have said the book is “a bit long” at 696 pages, but this article from Vox summarizes the key points and details. Piketty himself already has a strong reputation for his analytical work on income inequality – for instance, his work with Emmanuel Saez looking at US tax data was what showed that income was concentrating not just at “upper” income levels, but at the top 1%, the top 0.1%, and especially the top 0.01%. At a high level, the fundamental finding of the book and its underlying research is that the ratio of wealth to income is rising in all developed countries, the trend will likely continue absent extraordinary interventions, if it continues long enough the 21st century will look increasingly like the 19th century (where economic elites have predominantly inherited their wealth rather than working for it). In fact, Piketty argues that overall, this concentration of wealth may be a natural result of capitalism over multiple generations, that might have been evident globally even sooner if two global wars and a Great Depression hadn’t been so devastating to wealth (in essence, it caused a significant reset and has taken us this long to build back to high and growing levels of inequality). In normal times, as long as the return on capital remains higher than overall levels of economic growth (which is generally the case), compounding wealth will inevitably make the rich become exponentially richer over time and generations. Ultimately, the point is not necessarily against capitalism per se, but the recognition that this kind of wealth concentration across generations is ultimately damaging even for entrepreneurial capitalists, as the Forbes 400 list of the future may simply be dominated not by the founders of new companies but by the grandchildren of today’s super-elite. While any solution would thus be controversial, Piketty suggests the best solution may be a globally coordinated effort to tax [extreme] wealth. Get Ready for Regulators to Peer Into Your Portfolio – This article by Jason Zweig of the Wall Street Journal is a great summary of the recent FINRA proposal to launch CARDS, the Comprehensive Automated Risk Data System that would begin to regularly collect data on balances and transactions in brokerage accounts to identify wrongdoing by stockbrokers and investment advisers. The idea is that FINRA would gather this information weekly, and scrutinize the data to identify brokers doing excessive trading, questionable mutual fund switches, overcharging for bond trades, overconcentrating in risky assets, etc. Personal client information like Social Security numbers and other details would not be included (so FINRA won’t match client accounts across multiple platforms), and the feed will be data only, not any actual access to client cash or investments. In essence, the goal is simply to use the power of Big Data to try to better identify problematic brokers and high-risk activity. However, CARDS has had critics as well; some suggest it’s overkill, and even that it’s systemically risky to concentrate so much data and information aggregated together in one computer system, no matter how secure FINRA claims it may be. FINRA insists the data will be secure, and that the tool will allow it to finally do a better job enforcing against the greatest consumer abuses. CARDS will go to the SEC for final approval by next year, after further refinements and input from brokerage firms and the public. Or as Zweig puts it, soon it will be time for bad brokers to meet “RoboRegulator”. How Independent Advisors Can Beat Wall Street – This article by industry commentator Bob Veres discusses the shifting winds of the current regulatory environment, as proposals for a fiduciary standard may be “compromised” in a manner that would allow brokerage firms to conduct business as usual, due to the overwhelming influence that the brokerage industry has over both Congress and even the SEC. And unfortunately, the situation is not helped by the fact that much of what Wall Street does is so profitable, that the lobbying expenses and campaign contributions made to those in power amount to pennies on the dollar collected from the very activities that are then regulated into legality. So what’s the solution to this “we are right but they have the money” dilemma? Veres suggests that the better path is to recognize that this kind of regulatory capture scenario is a problem across multiple industries, and that accordingly organizations fighting for a fiduciary standard should reach out to other groups fighting similar “right” uphill battles elsewhere in the economy, and cooperate with each other on what he calls “the Bigger Fight” to save/improve our economic system. Not only would this approach allow for a wider base of support, but Veres also suggests that many of the indignities that happen in our industry (like regulators going lenient on the industry and then ‘coincidentally’ getting 7-figure private sector jobs afterwards from the very firms they once regulated) are likely paralleled in others, and by working together and bringing light to the collective issue, there may be opportunity to generate more public outrage and greater public support for change. The bottom line, though – it may be time to find allies, as this simply might not be a battle we can win alone. Why You Should Worry About Marketing – This article by Gail Graham of United Capital makes the point that advisory firms are not paying enough attention to marketing, which for any advisor who doesn’t have a near-term-retirement outlook of their own needs to think about, both for the general growth of the firm, and to support it in the face of an aging client base that is shifting from net savers to net retirement spenders (not to mention eventually client attrition due to death). And unfortunately, Graham notes that referrals may not be the successful path they once were, due both to an increasingly digital world where consumers – especially younger clients – are searching online more and more for product and service providers; in addition, there’s the simple reality that for long-standing clients in a mature advisory practice, the potential referral stream is already mostly tapped out. Yet Graham suggests that most advisory firms are not prepared for the marketing battle that is emerging, especially smaller firms that will have to compete as larger advisory firms invest new resources in marketing, and even fewer have a clear understanding of who they really are trying to market to in the first place. Other marketing challenges include the fact that few firms really have anything interesting to market at all (every advisor thinks they are special and unique, but in practice most sound exactly the same! ), most don’t have the skillsets to build and sustain a disciplined marketing program (and/or lack the capital to hire someone to do so), and many don’t even have the basic technology infrastructure to support an ongoing marketing program (e.g., a CRM system with a robust prospect management capability). The bottom line: the industry is becoming more competitive, and while marketing has never mattered very much in the past to most advisory firms, the times are changing. In the meantime, if you’re interested in more news and information regarding advisor technology I’d highly recommend checking out “Bill Winterberg’s “FPPad” blog on technology for advisors.